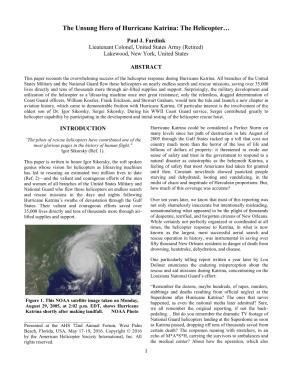 This paper recounts the overwhelming success of the helicopter response during Hurricane Katrina. All branches of the United States Military and the National Guard flew those helicopters on nearly endless search and rescue missions, saving over 35,000 lives directly and tens of thousands more through air-lifted supplies and support. Surprisingly, the military development and utilization of the helicopter as a lifesaving machine once met great resistance; only the relentless, dogged determination of Coast Guard officers, William Kossler, Frank Erickson, and Stewart Graham, would turn the tide and launch a new chapter in aviation history, which came to demonstrable fruition with Hurricane Katrina. Of particular interest is the involvement of the oldest son of Dr. Igor Sikorsky, Sergei Sikorsky. During his WWII Coast Guard service, Sergei contributed greatly to helicopter capability by participating in the development and initial testing of the helicopter rescue hoist.